My daughters teacher was out today, this means one thing…less homework – WooHoo!!! This presented me and my girls the perfect opportunity to play Bounce-Off, a game that was sent to us courtesy of BzzAgent.com. I can’t say that I’ve ever seen this games at the stores or maybe I just wasn’t looking for it. After playing Bounce-Off with my girls, I’m ready to share my thoughts on this game. 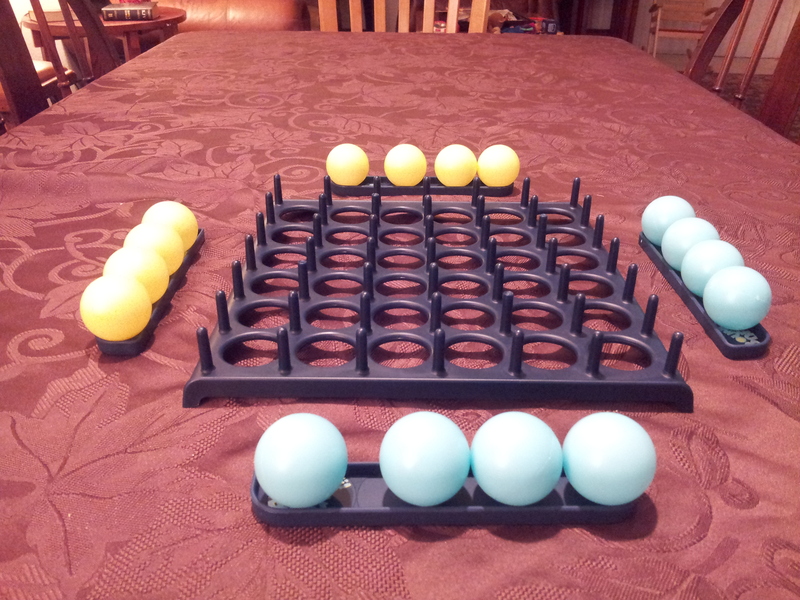 Bounce-off comes with 16 balls (in two colors), four ball tray holders, the game tray and cards. The games states that it can accommodate between 2-4 players. Here’s how to play the game, you line up 4 of each colored balls on the ball tray’s. place the game tray in the middle, then pull a card. Each card comes with a pattern on it. the person to “bounce” their balls into the game tray and form the pattern first wins the card. Whoever collects the most cards wins. At first, my daughters were placing the balls into the game tray, then tossing the balls (that’s not the way you should play) but I gave them some time to get familiar with it. Then, we got to bouncing! This is a very simple and fast paced game (excellent for eye and hand coordination). I not sure how four people would play other then in teams, otherwise you would have to use the other players “bounce” to form your shape. That could become hard to determine since the balls only come in two colors and some shapes require 5 balls to complete. Remember, this is fast paced game, so in the heat of the game some people could cheat forget. Although the game states it’s for ages 7+, my four year old did enjoy it with some alterations. I like that it made my little one think quickly about how to form and count the amount of balls are required to form the shape on the card. I would like to see more shapes card options and four different colored balls. We altered the game rules by cutting the players down to 2 and I gave each of my girls all eight balls. I managed the cards and kept track of the winner of the card. My little one pretty much “tossed”the balls in the game tray to replicate the shapes on the card and my 8 year old “bounced” the balls into the tray. Playing this way allowed them to build their shapes that contained 5 balls. At the end of our game session, we turned into a game of speed. I’d turn over the card, my girls would form the shape’s as quickly as possible (no bouncing). I’m sure we could come up with all kinds of variations for this game. My 8 year old was moderately ok with the game. I do believe that is she and one of her friends could have a great time with this game for about 15 minutes (which is the exact time the box states that the game takes to play). I can also see beating enjoying this game with my husband just to have some fun for a few minutes. Playing as teams I can see how this game would work great to develop bonding/team work. I’m sure my Girl Scouts would enjoy it as a quick game. Young and old can play, just make adjustments according to age and be prepared to chase down the balls that bounce off the table. My husband made reference to it being like a “beer pong” style game. Yes, it would work in those instances as well. A group of adults could easily gather around a table for with this game. All in all, it is a fun, very simple and fast paced game that had us laughing. After the game my 8 year old and I were bit impartial to this game but thinking about it, this is probably be a game we will play a lot since my four year old could set it up and we could play a game in just 15 minutes.Thanks Bzzagent and Bounce-Off, it was a refining way to spend a little time with my girls! I am a BzzAgent and received this product from BzzAgent.com to provided an honest and unbaised review of the product. I have received no monetary compensation for this product and my opinions are completely my own.